Looking onwards, racing towards the shore line, seeing the shore lines of the west coast of the Auckland. Seeing the sandy black sands of Piha, watching people below enjoying the adventurous challenging surfs of is beating crushing waves pounding its shore line. Looking below, looking for a spot where I used to surf adventurously, also on the left distance that same house that I used to time share with friends during summer season when in my younger youth. Spend endless days on end on surfing Piha. Looking back that house, seems a little bit empty now. 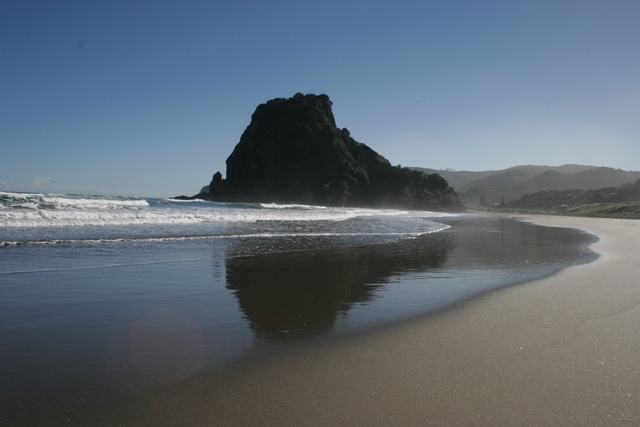 Piha Beach, spends endless days during summer and late spring with friends.—- old photo.. Turning Mia around a navigation beacon located around Auckland city on one of the tallest towers in the city, some 600 meters high, which services as a shuttle docking facilities, and services as one of many subspace communications towers in Auckland. In some century years back wellington was to have one, until that unfortunate day it collapsed the first one built in the country under a massive earthquake, and the tower fell onto the Beehive also the parliament buildings, and Wellington wasn’t the same again. So the capital got relocated to Auckland, very much so it became a massive living city museum in some parts. Slowing down, Mia. As making ways to head down south, of Auckland pasting Auckland international Airport, then crossing into the main aerial shuttle traffic on wards to just before rural Papakura township, seeing it now, once a small rural township, it’s now one of the busiest townships in New Zealand, growing into New Zealand’s second largest international space port, Ardmore, Ardmore interstellar, next to Auckland international, now Auckland Interstellar Port. Pasting Ardmore, seeing now how large they expanded into other older former farm lands, seeing only a few Kilometres away from the Ardmore, seeing a yellow summery painted home, very much like the Kent’s in Smallville, with the traditional barn house attached to it. Seeing the barn house remind me, Em’ my sister sharing the same loft type bedroom, so much room.. Slowing down, making the necessary manually landing procedures, as I see more the yellow house wooden panel walls more in to nearly ground level, and the white corrugated painted roof line disappears. Gently landing Mia, and hearing her landing systems touching the ground with a slight gentle thump. Then shutting down her main systems, then walking out, and making way out into a wintery farming chill gushes in the shuttle as the hatch opens outwardly . Grapping a jacket, from warmth from the airlock’s locker, putting it on, while walking out, on to a slightly muddy terrain, noticing it must have been massively showering with rain few weeks ago. Walking onwards to the whitely painted deck, stopping at the front door, then it unlocks the door with a bioscan. It unlocks. Stepping inside making ways to the first thing I think of is the kitchen.. then I saw mother, her dark crimson red hair pony tie back, fixing something with several devices. It was the food replicator. Then I spoke out “ Mom” then she look back in surprise warmly welcoming “ El’…! “ Short for Elise. She stopped what she was doing she came, walked over and gave a genlte kiss on the temple of my forehead, then gave a massive hug, like that warmthly hug saying out you’re alright, you’re home….. Home. That second week, I’ve updated, all the upgrades that are needed later on, transmitting back to USS Tauriel. Then I had guilt, so I’ve decide to call my folks. Hoping that they will, be home, or taken their communication device. Calling………hearing a ring… tone, but no one receiving, then again calling….hearing a tone…none….. They either left their device at home, or they might be in the field, Thinking of both situations where they’re in the field. So, I’ve decide to surprise them, packing my clothes, also other few things into a suitcase also a copy of my whole wardrobe on a replicator isolinear chip so later on I could replicate any clothing that I’ve have here at my folks place. Know this is going to be a short trip between. Walking to the bedroom console, holding up a padd up, then starting to shut down some non- necessary items down at home, and leaving only the main systems on. Looking around the place seems bolted. Walking up to my bedroom on top of building, with over sees the view of the garage on the roof, I proceed to ready my home build Yellowstone heavy shuttle variant, turning on her systems on, also placing a couple of suitcases, in one of the living compartments in her. I’ve settled the remaining shutting sequences down. As I sat on helms chair, piloting her out, from the hanger, as the home’s hanger door begins to shut everso automatically as the lock down sequences finalised. Racing rapidly above the Los Angeles night sky, flying away trying to merge with the flying traffic, in a sort off manner . Racing waywardly past the Santa Monica’s pier, watching the people below from the helms window of Yellowstone variant shuttle, named Mia Toretto. Then re -concurring my flight plan with air traffic control. Seeing the rear image stream of Californian West Coast line disappearing the on one of the many displays as it welcomes the view of the pacific ocean. Trying to be Diplomatic – Looks like shore leave is over. Having had a massive shore leave, thinking it was about time I got back into things. The ship was ready had, a massive retrofit through out its system before we decide it was time for shore leave. It was interesting recabling the ship’s EPS wiring thoughout the Jefferies tube, crawling around with the engineering team, it was fun, learning a lot from the shipyard engineers also. Looking back it only took a good hard works of three weeks, everything had been organised, when came in back from deep space. We added gave her, also a major hull reconstruction, out from a basic Miranda class’s super structure framework, while keeping her main systems onboard. Orthough, it would have taken us almost three months to complete giving her new clothing. But, at that time, the San Francisco and Mars Utopia fleet yards had some modular hull parts that they already constructed on and some of them that we needed have finished, and readily to be installed on after a conversion within three weeks of retrofitting her, U.S.S Tauriel. So a new hull, new nacelles also new systems. My shore leave was great, a full three week worth. , when back home, to my loft and just spend most of the time on beach, and hanging around with family and friends, checking out a living museum shopping complex naming Santa Monica place. The food was great, having sampling some interesting fusion food, from an Asian fusion SOHO restaurant. Even today that taste still lingers. Holding my tongue, figuring, forensically what’s that special ingredients are, still? My first week was spending time, looking over the new specifications of the USS Tauriel, also getting to know her again. Making corrections, checking them in a home build Holodeck in a section of my loft. In which is a converted SOHO warehousing, moderately size building, looking back it took me several years converting the place, floor by floor, installation by installation. When I first got it, it was very much derelict building but it had character to it, historically. Now it felt right, but there are a few, no several more empty sections of the building, waiting to be filled out. Maybe after a few months I’ll go shopping for some more items. Somehow that first week, I’ve haven’t told that my folks, that I’ve got shore leave. Big massive opps….! Got really, lost in getting to know the new systems in place, also work aswell. Wondering if I had made the right designs modifications to install the beam arrays, or the installation of Dual beam arrays. Guessing that, think that I’ve made the right choice, of installing the Beam arrays, instead of installing the dual beam which have only a minimiumly small firing angle. After spending the first weekend trying all, well mostly simulations, combat situations to figure out how she’ll joust and parity. Lives and work in between two cities, Los Angeles’s Santa Monica and works in San Francisco’s Starfleet Command Headquarters, also moves constantly alot throughout Federation and non-Federation space. Spends most of the time tuning home built shuttle crafts, also modifying Starships. Also relaxing, shopping, reading, also spending time with friends around my home town in Santa Monica. 十三 Orchid Megan Wu Story | it’s 1955 December Hong Kong early morning with that illumined white blinding light..
十三 Orchid Megan Wu Story | it’s 1955 December Hong Kong in good company with coffee finding Gravity..
十三 Orchid Megan Wu Story | it’s 1955 December Hong Kong making coffee..
Emilia Anne Wasson – Admiral Emerald Wu | A now small Box and two pens ………….? The trials and tribulations of Team Banana Punch, the greatest gamers who ever gamed casually. Your Knight in shining Armour for Gaming and Tech news and reviews.